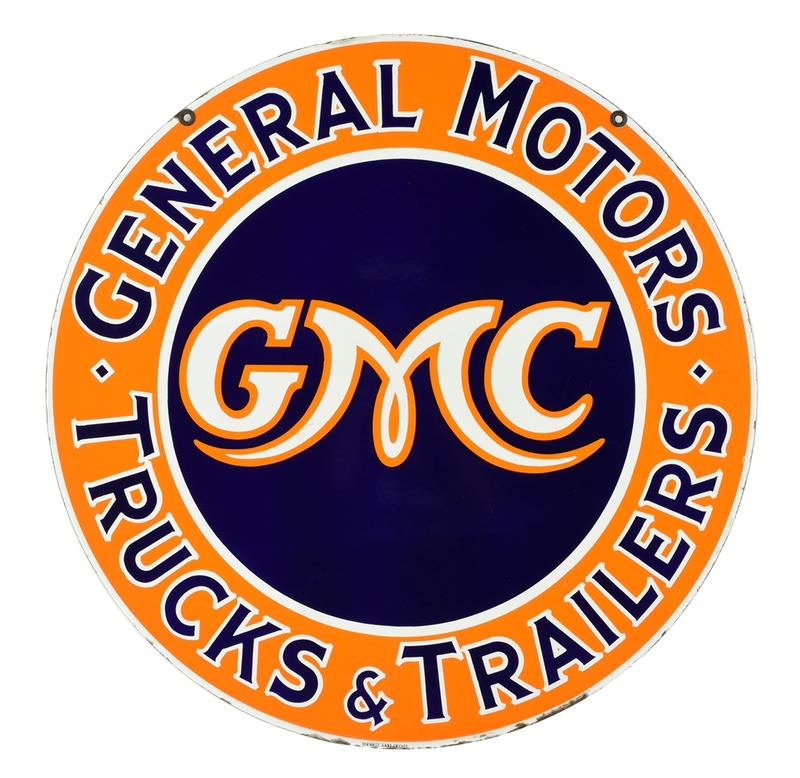 Lot #1: Incredible General Motors GMC Trucks & Trailers Porcelain Dealer Sign. 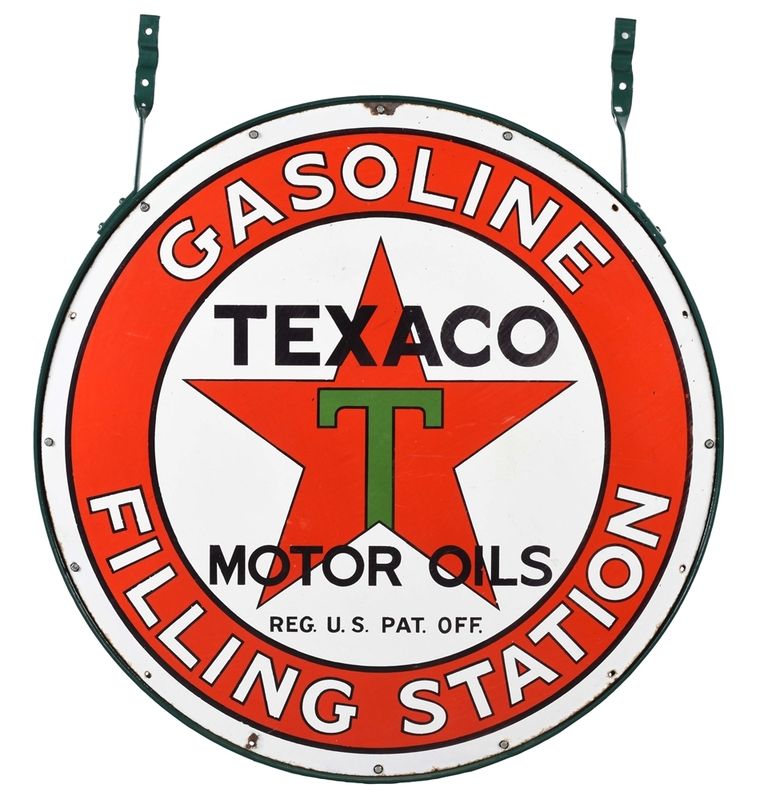 Lot #2: Outstanding Texaco Gasoline Filling Station Porcelain Sign. 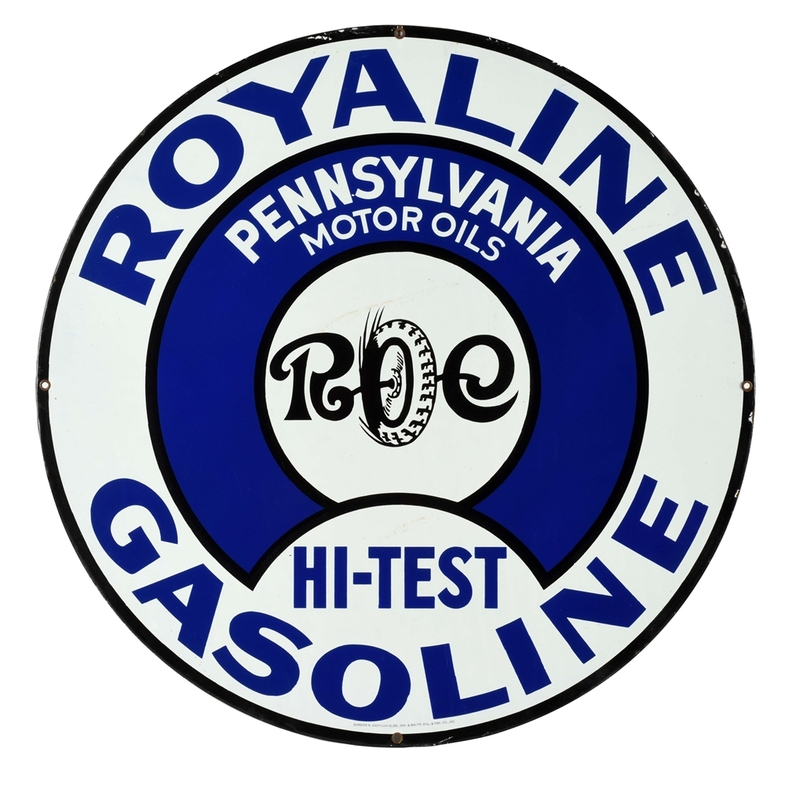 Lot #3: Incredible Royaline Hi Test Gasoline Porcelain Curb Sign with Tire Graphic. 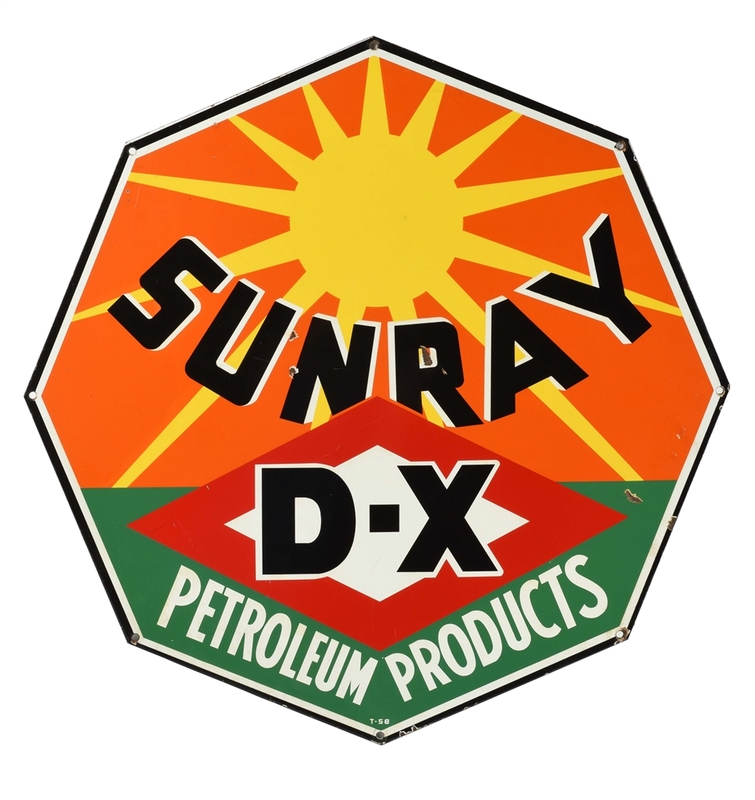 Lot #4: Very Rare DX Sunray Petroleum Products Albino Porcelain Curb Sign. 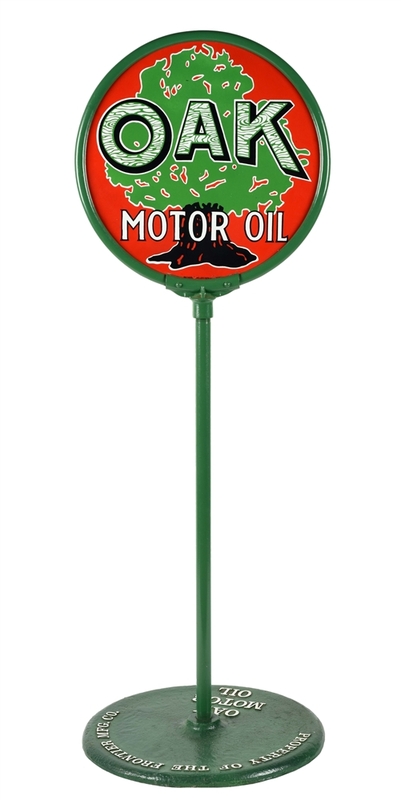 Lot #5: Outstanding Oak Motor Oil Porcelain Lollipop Curb Sign with Oak Tree Graphic. 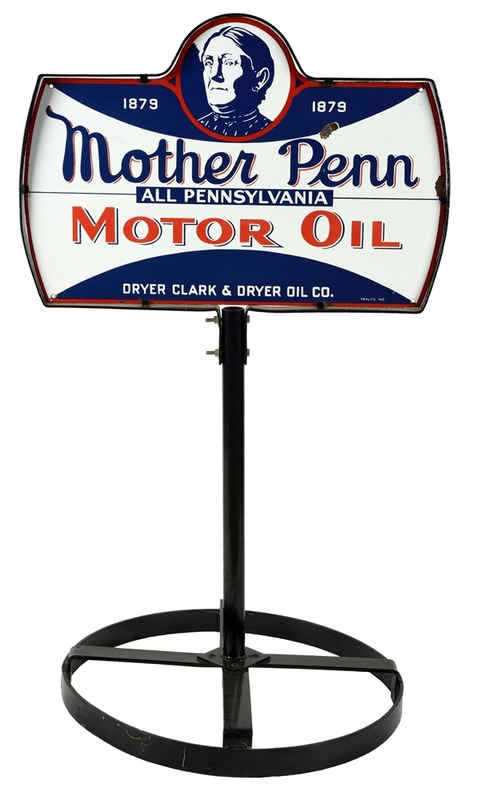 Lot #6: Very Rare Mother Penn Motor Porcelain Curb Sign with Mother Penn Graphic. 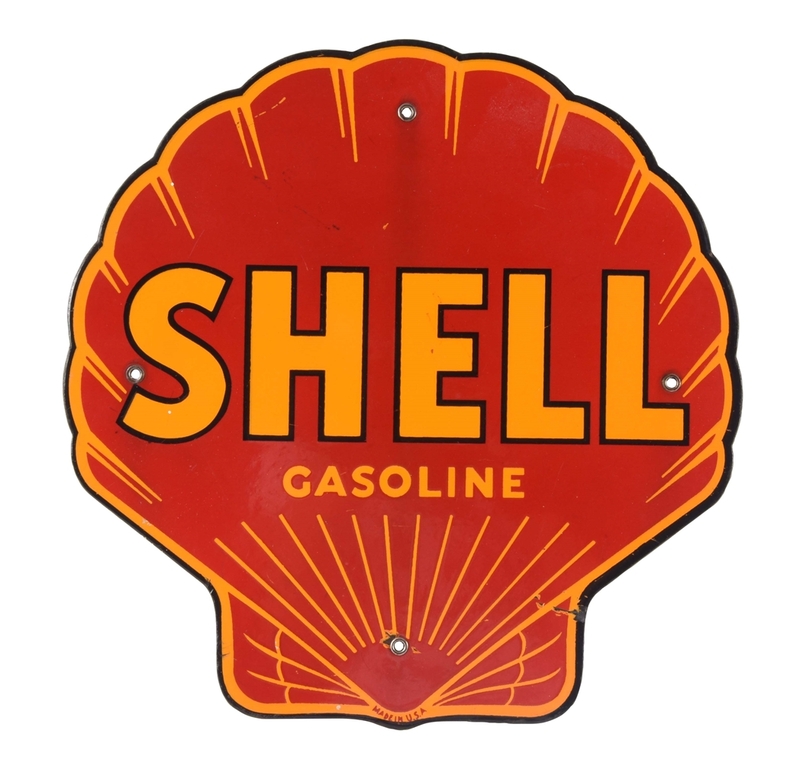 Lot #7: Shell Gasoline Die-Cut Porcelain Pump Sign. 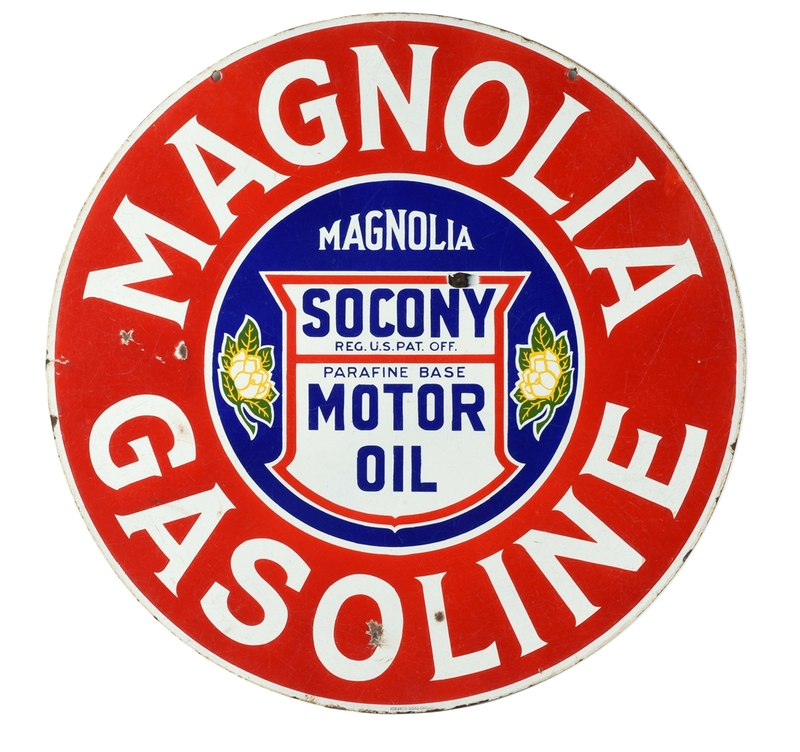 Lot #8: Rare Magnolia Gasoline & Socony Motor Oil Porcelain Curb Sign with Socony Shield Graphic. 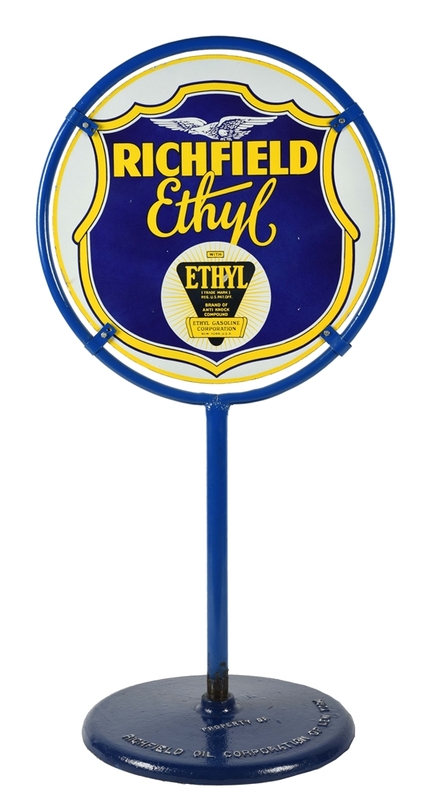 Lot #9: Richfield Ethyl Gasoline Porcelain Lollipop Curb Sign with Eagle Graphic. 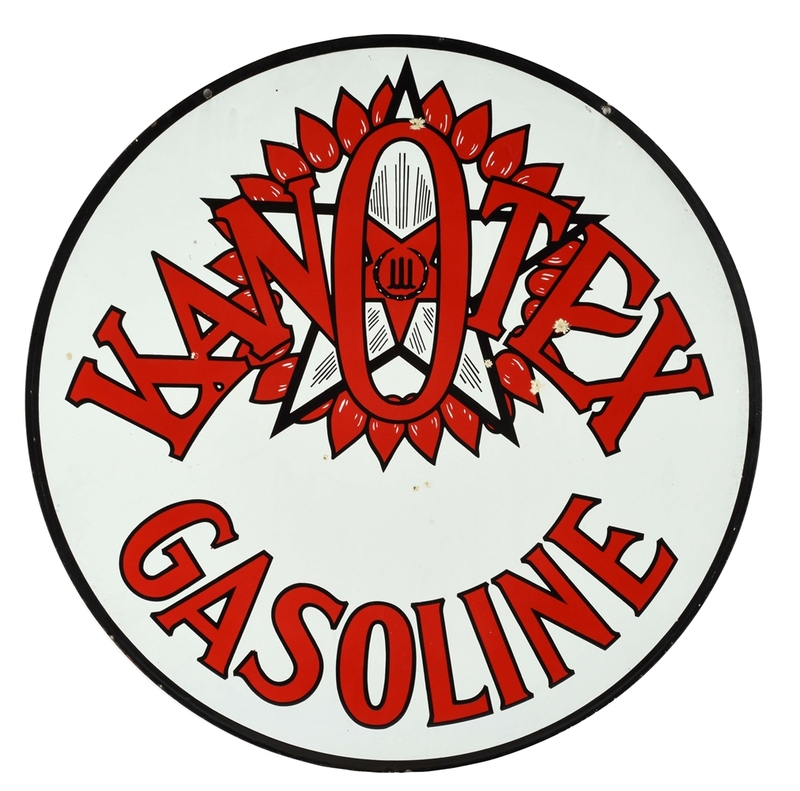 Lot #10: Very Rare Kanotex Gasoline Porcelain Curb Sign with Flower Graphic. 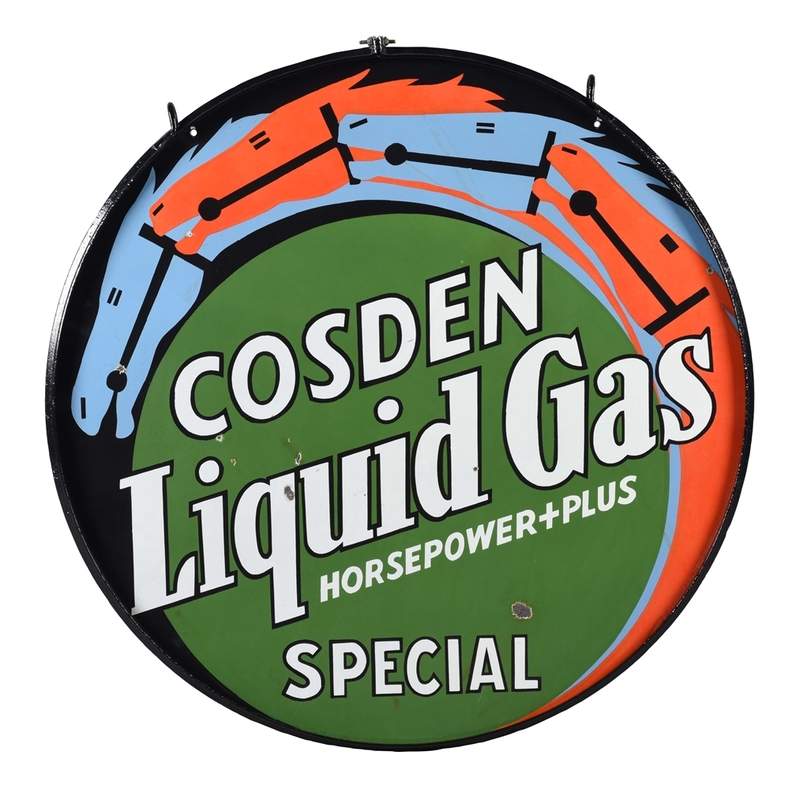 Lot #11: Rare Cosden Gasoline Liquid Gas Horsepower Plus Special Porcelain Sign with Horse Graphics. 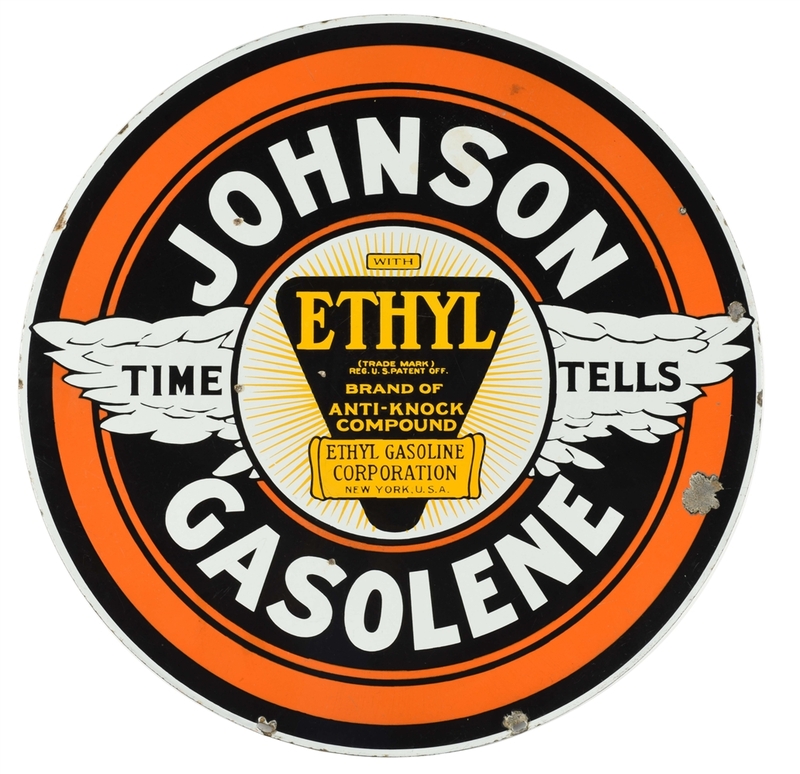 Lot #12: Johnson Time Tells Gasoline Porcelain Curb Sign with Ethyl Burst. 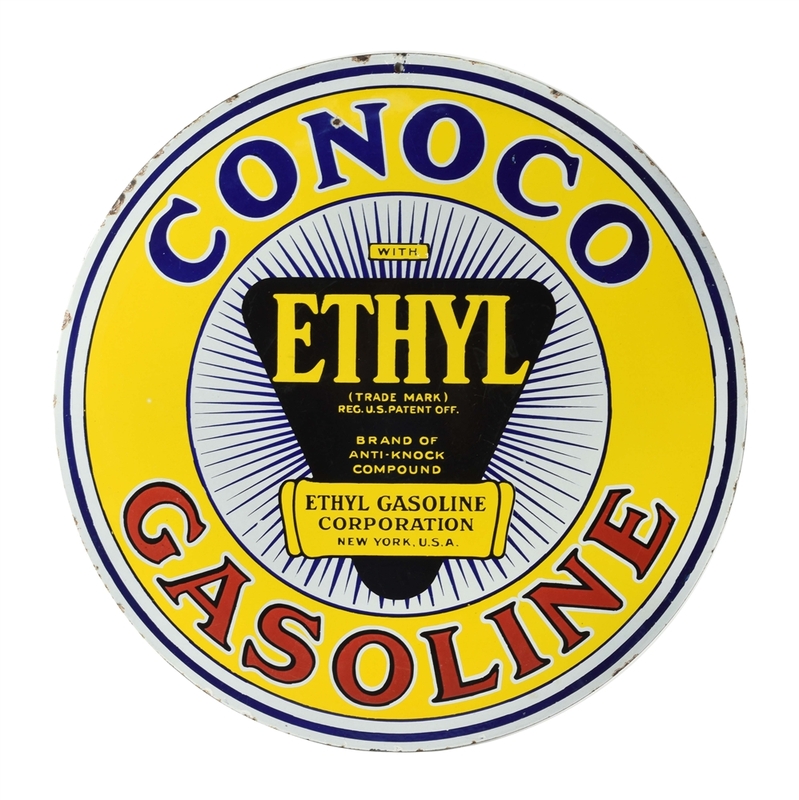 Lot #13: Rare Conoco Ethyl Gasoline Porcelain Curb Sign with Ethyl Burst Graphic. 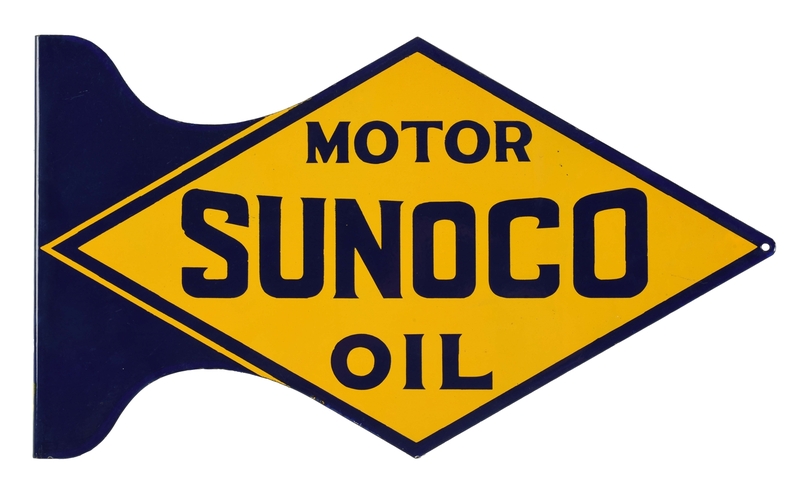 Lot #14: New Old Stock Sunoco Motor Oil Die Cut Porcelain Flange Sign. 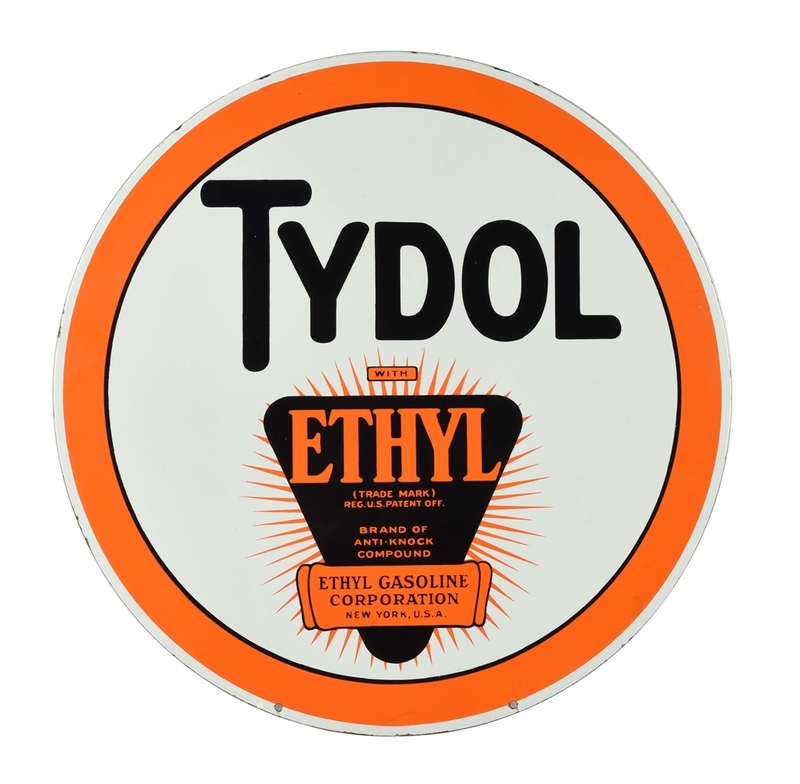 Lot #15: Incredible Tydol Ethyl Porcelain Curb Sign with Ethyl Burst Graphic. 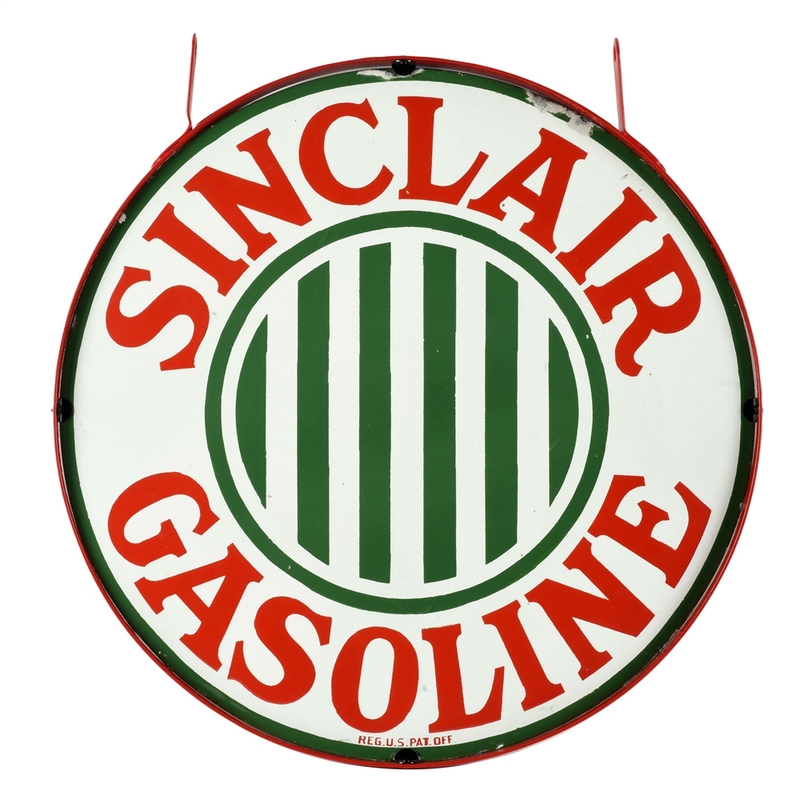 Lot #16: Very Rare Sinclair Gasoline 30" Porcelain Curb Sign with Bar Graphic. 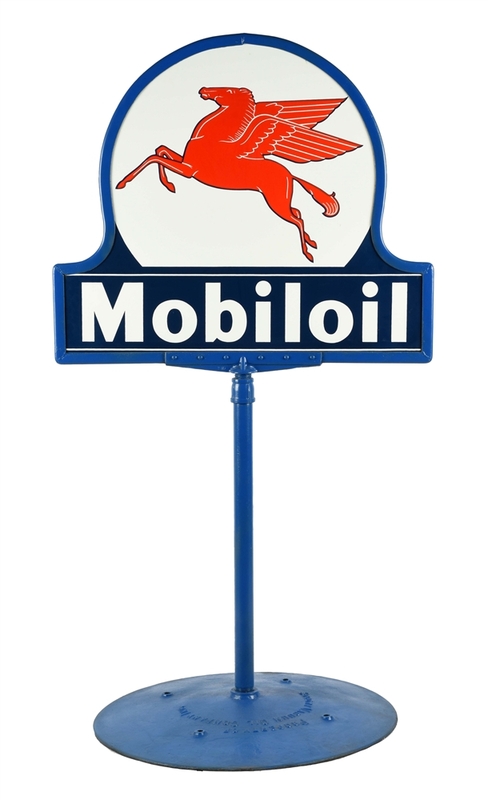 Lot #17: Outstanding Mobiloil Porcelain Keyhole Lollipop Sign with Mobil Pegasus Graphic. 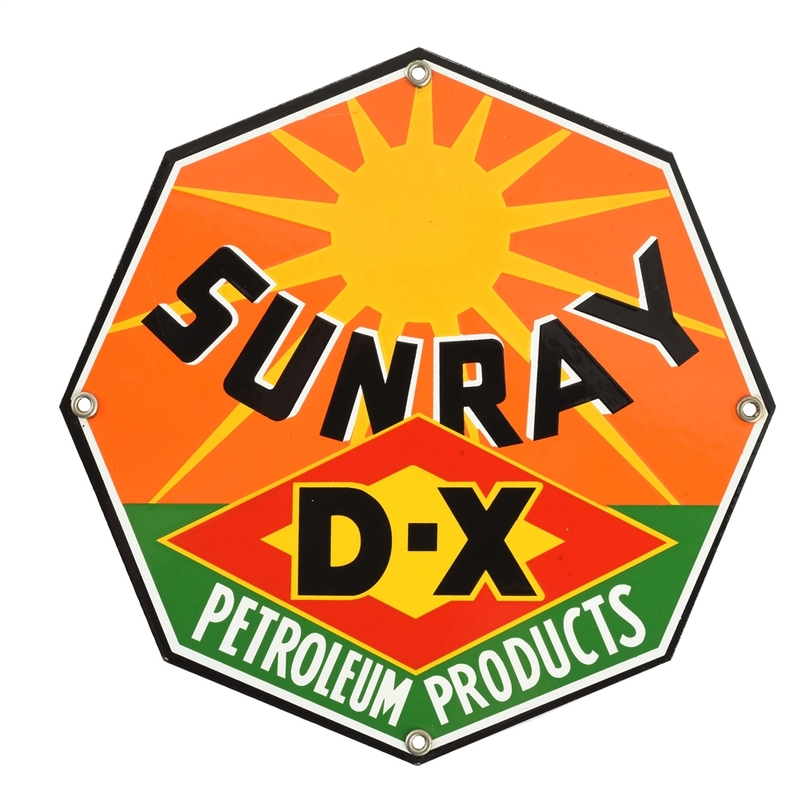 Lot #18: DX Sunray Gasoline & Petroleum Products Porcelain Curb Sign. 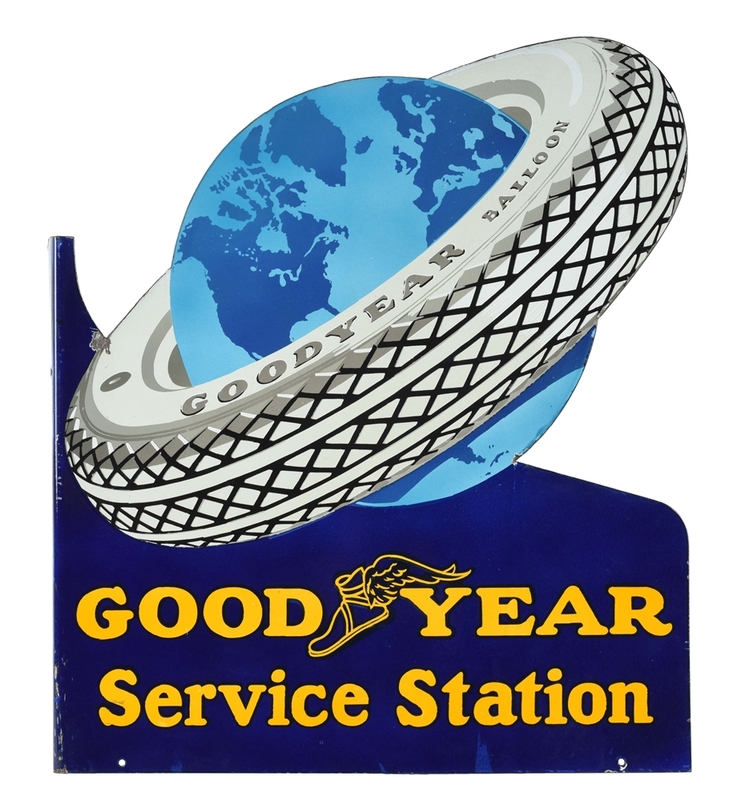 Lot #19: Goodyear Tires Service Station Die-Cut Porcelain Flange Sign with Tire & Globe Graphic. 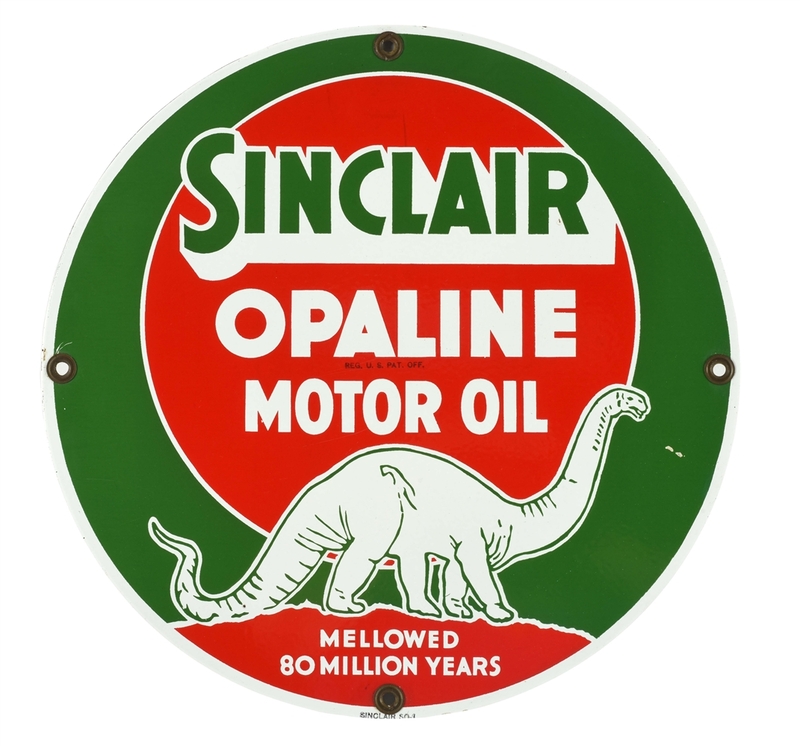 Lot #20: Very Rare Sinclair Opaline Motor Oil 16" Porcelain Sign with Dino Graphic. 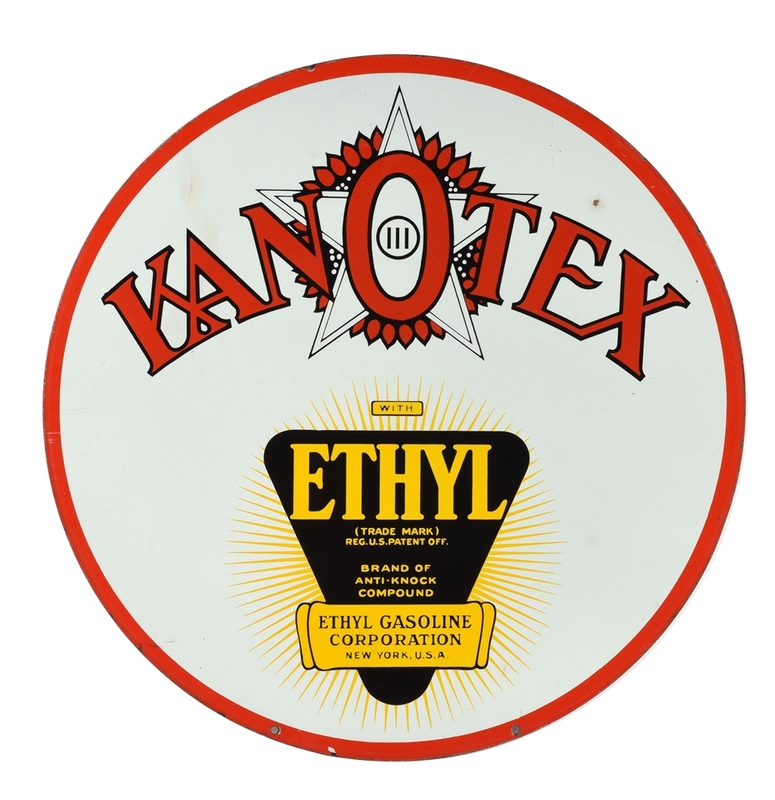 Lot #21: Kanotex Gasoline Porcelain Sign with Ethyl Burst Graphic. 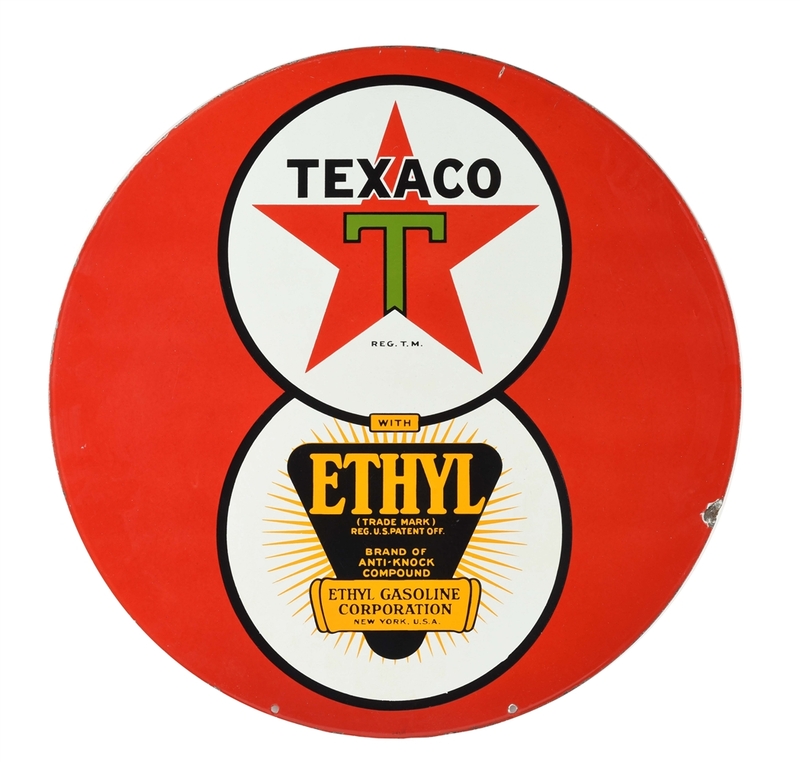 Lot #22: Rare Texaco Ethyl Gasoline 8 Ball Porcelain Curb Sign. 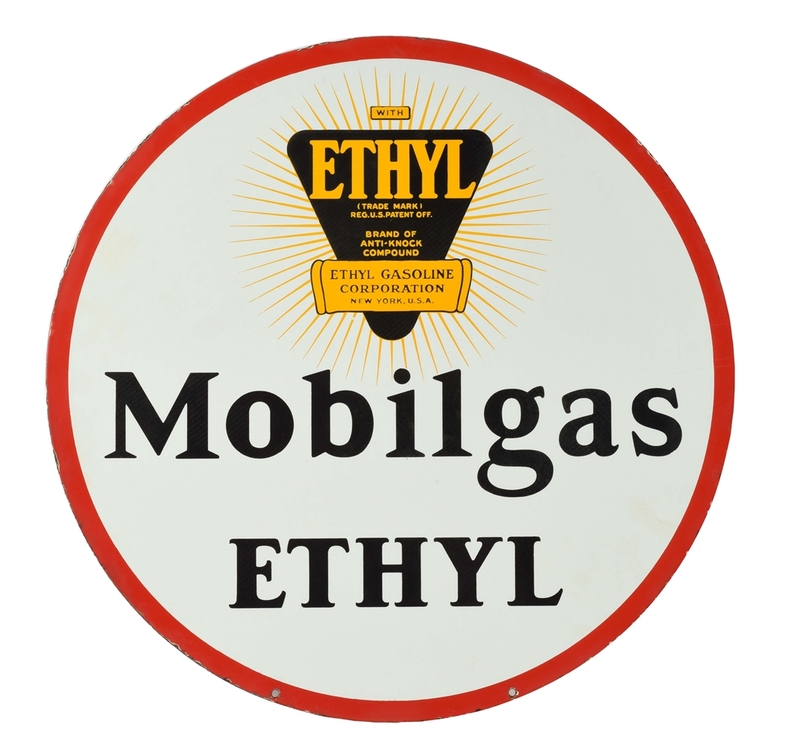 Lot #23: Mobilgas Ethyl Porcelain Curb Sign with Ethyl Burst Graphic. 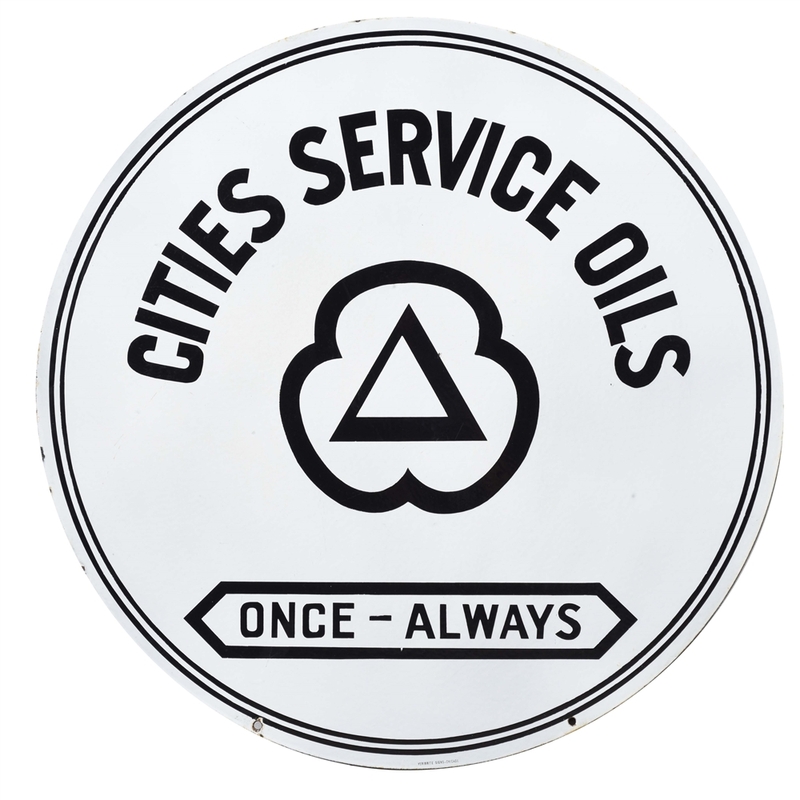 Lot #24: Outstanding Cities Service Oils Porcelain Service Station Sign. 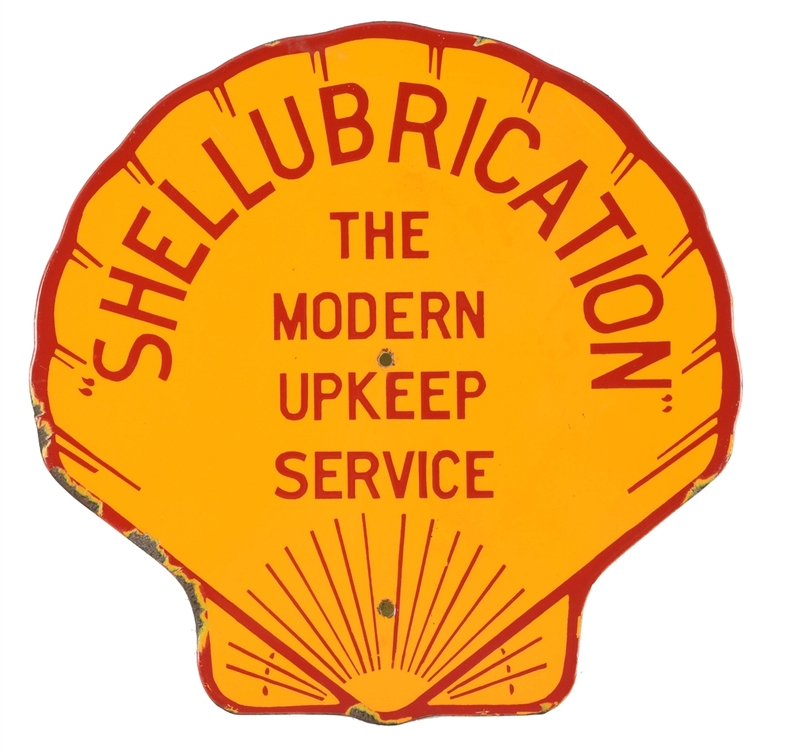 Lot #25: Shell Gasoline & Motor Oil Shellubrication Porcelain Rack Sign. 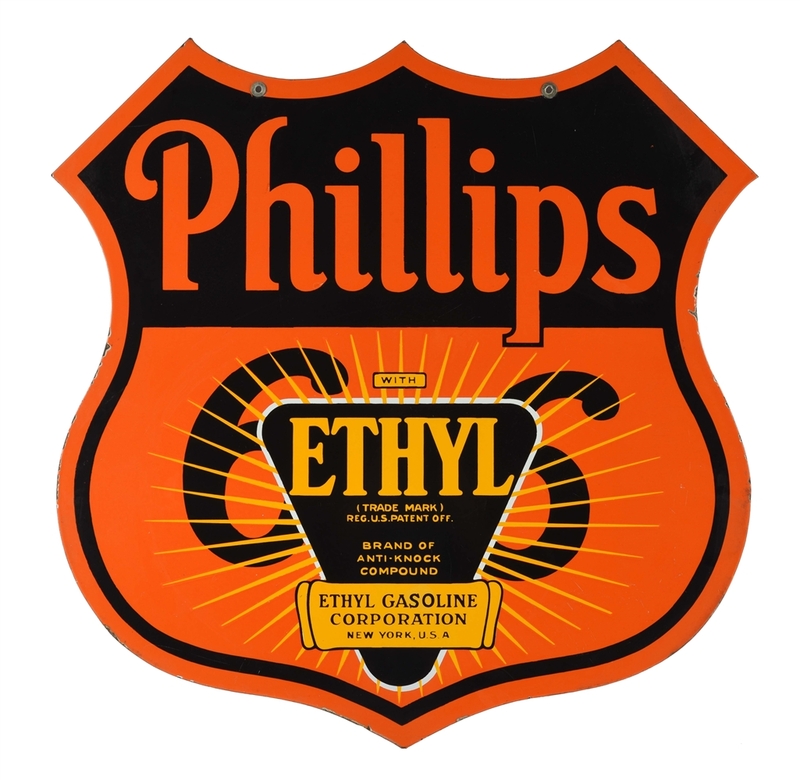 Lot #26: Phillips 66 Ethyl Gasoline Porcelain Shield Sign. 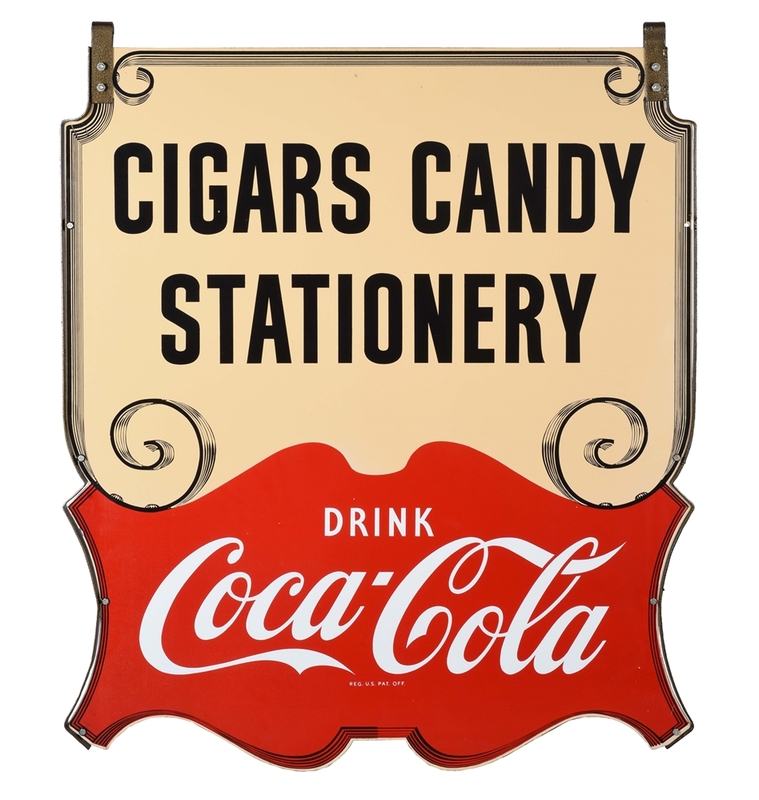 Lot #27: Outstanding Coca Cola Cigars Candy & Stationery Die-Cut Porcelain Sign with Metal Hanging Brackets. 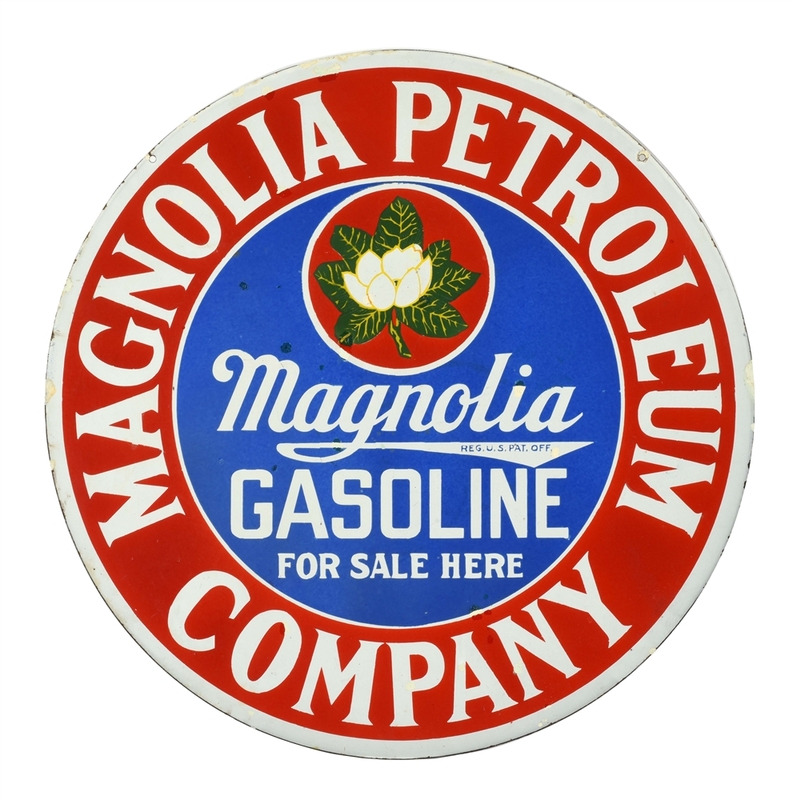 Lot #28: Magnolia Gasoline For Sale Here Porcelain Curb Sign with Flower Graphic. 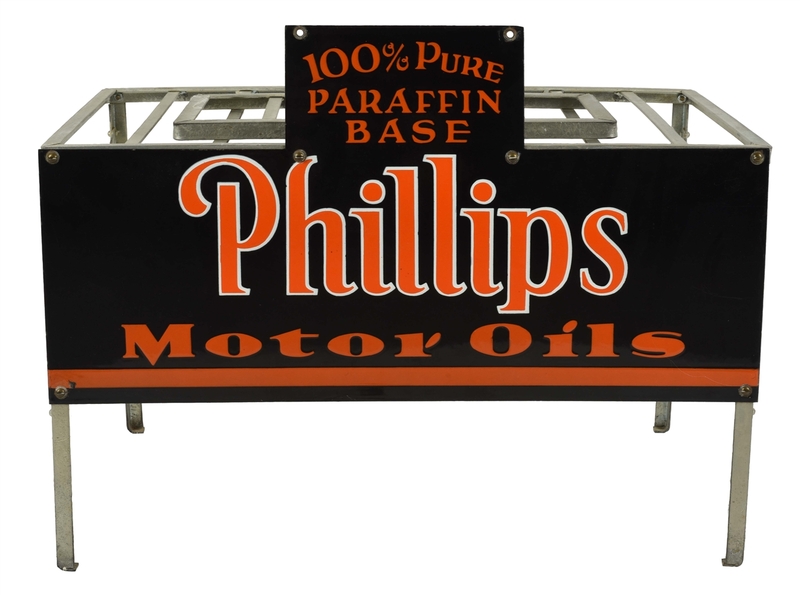 Lot #29: Rare Phillips 66 Motor Oils Porcelain Rack Sign with Original Metal Rack. Lot #30: Red Crown Gasoline For Power Mileage & Polarine Motor Oil Porcelain Thermometer. 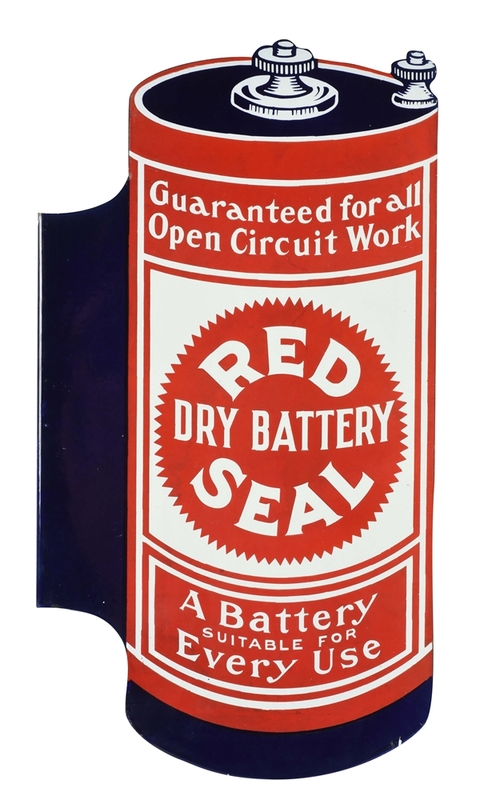 Lot #31: New Old Stock Red Seal Batteries Die-Cut Porcelain Flange Sign. 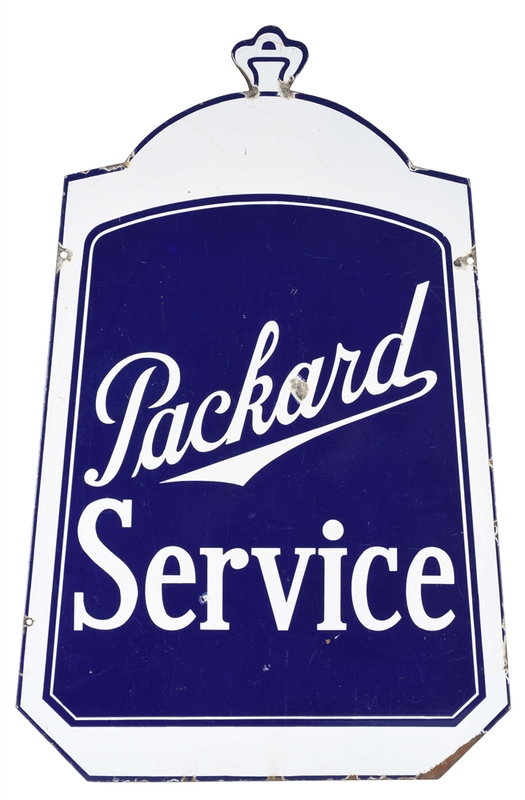 Lot #32: Packard Service Die-Cut Radiator Porcelain Sign. 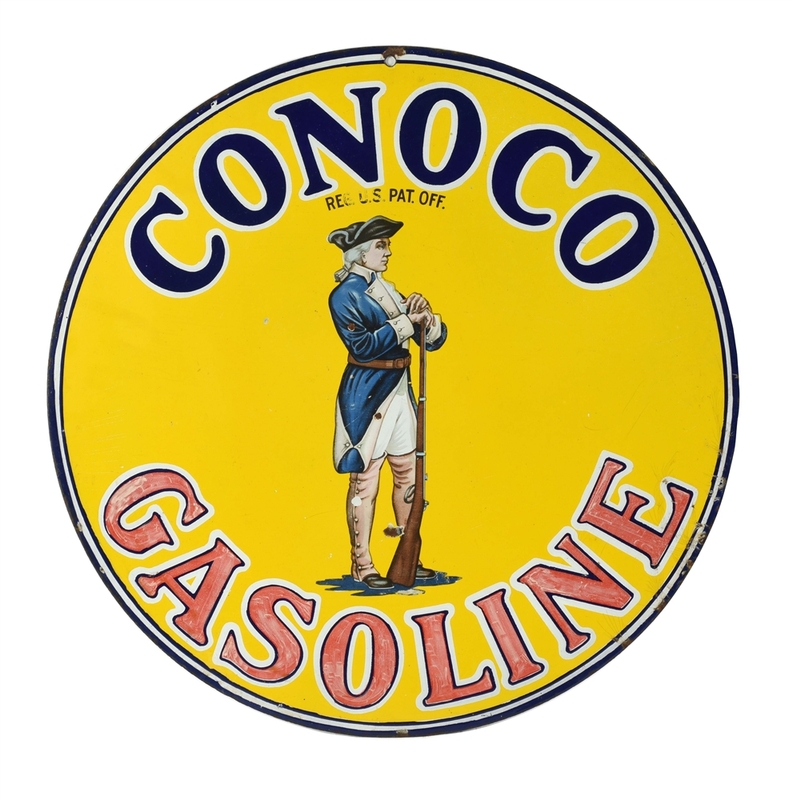 Lot #33: Conoco Minuteman Gasoline with Minuteman Graphic Porcelain Curb Sign. 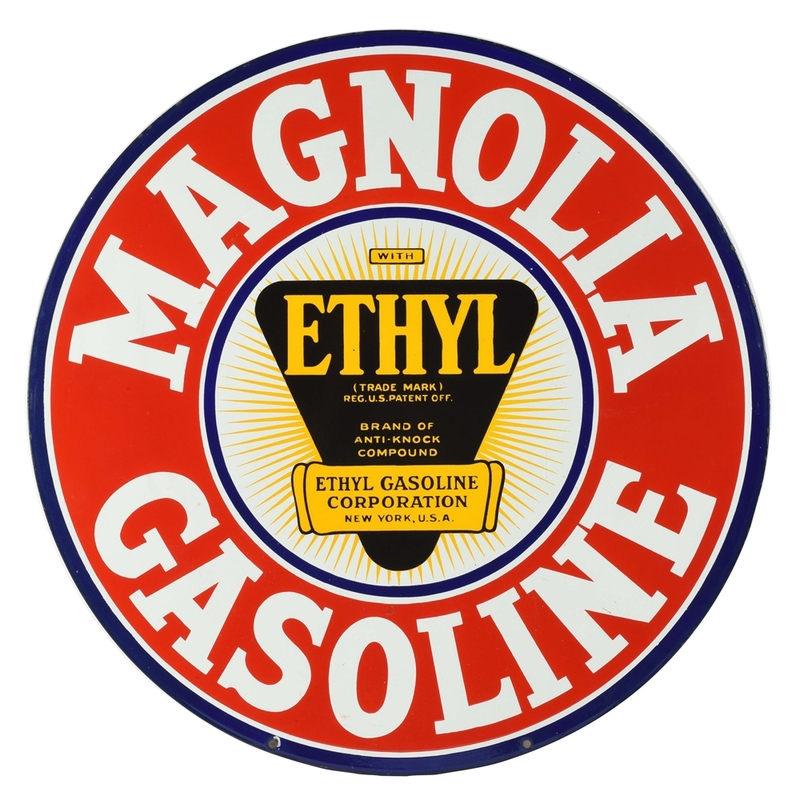 Lot #34: New Old Stock Magnolia Ethyl Gasoline Porcelain Curb Sign. 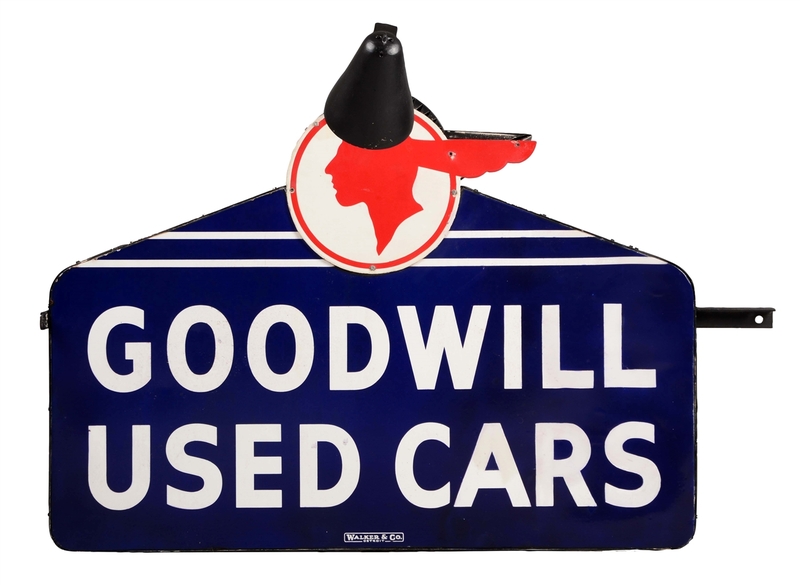 Lot #35: Goodwill Used Cars Die-Cut Porcelain Dealership Sign On Metal Can with Light Sconces. 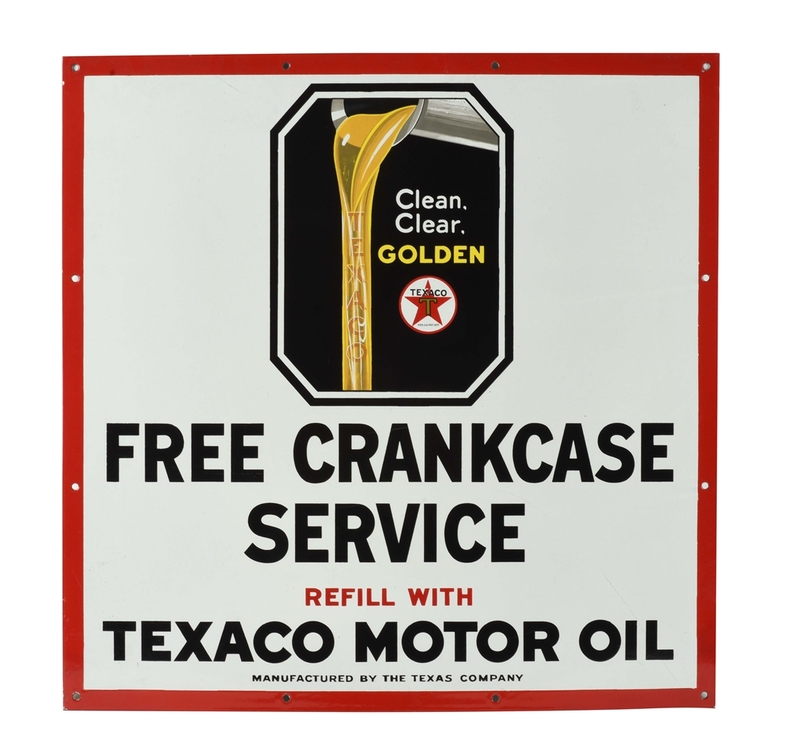 Lot #36: New Old Stock Texaco Motor Oil Free Crankcase Service Porcelain Service Station Sign. 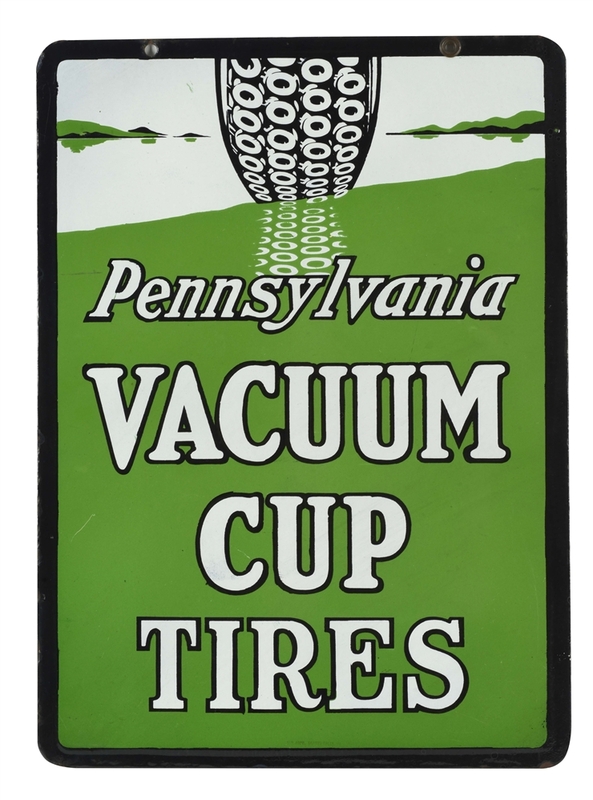 Lot #37: Outstanding Pennsylvania Vacuum Cup Tires Porcelain Sign with Tire Graphic. 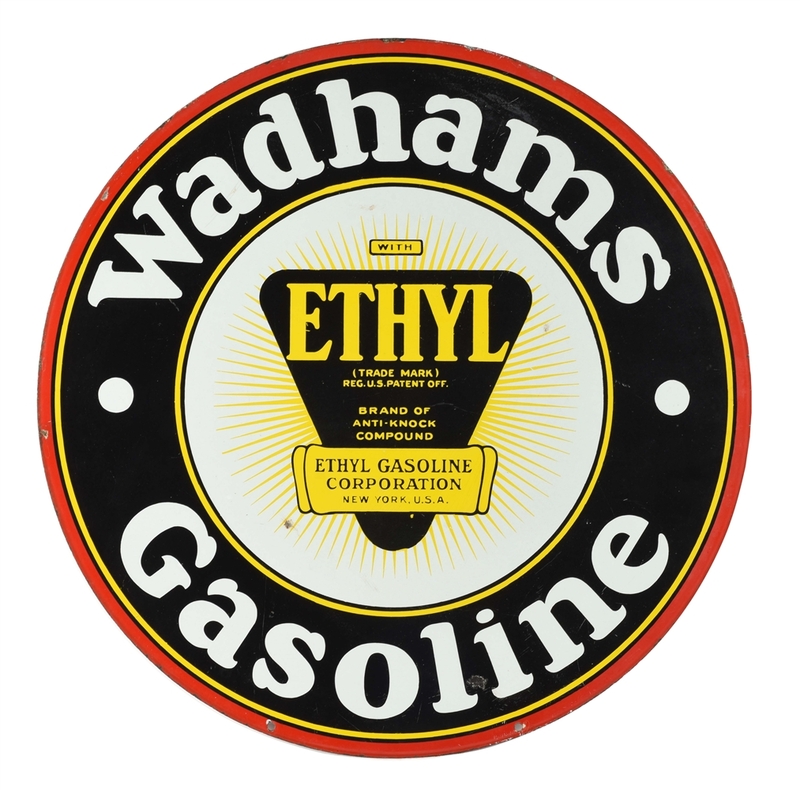 Lot #38: Wadhams Gasoline Porcelain Curb Sign with Ethyl Burst Graphic. 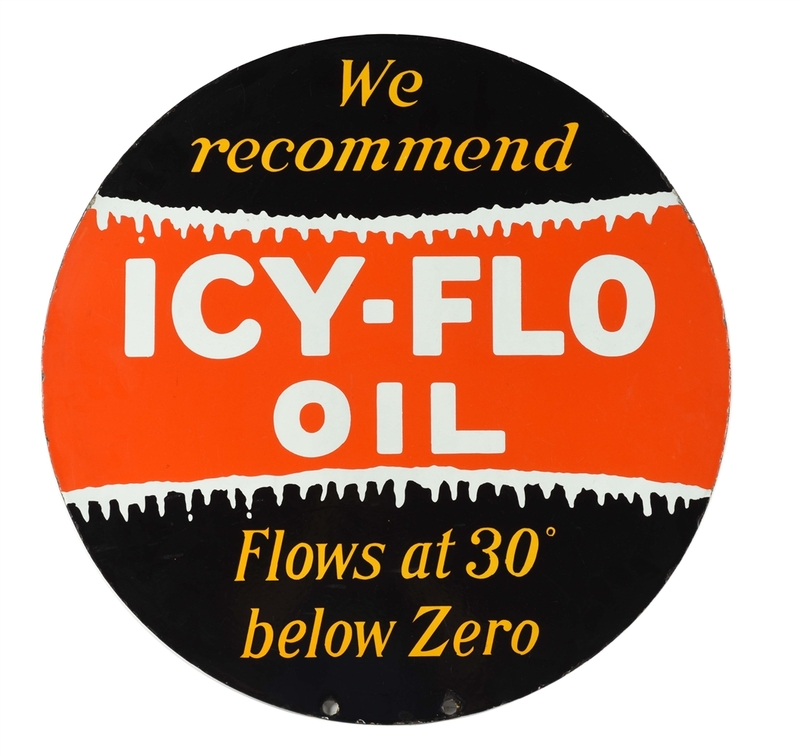 Lot #39: Icy Flo Motor Oil Porcelain Curb Sign. 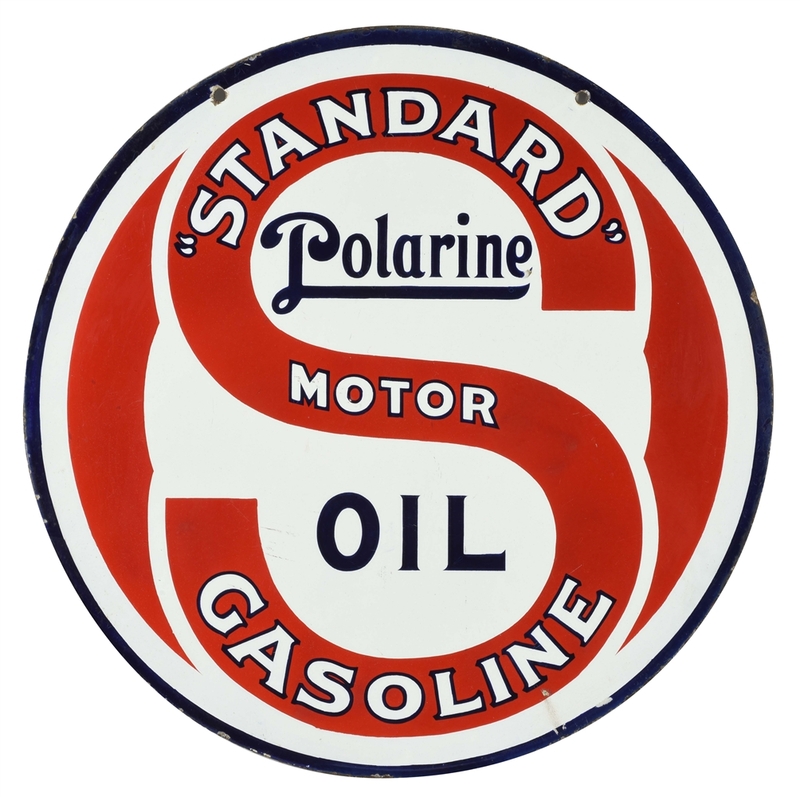 Lot #40: Standard Gasoline Of New Jersey & Polarine Motor Oil Porcelain Curb Sign. 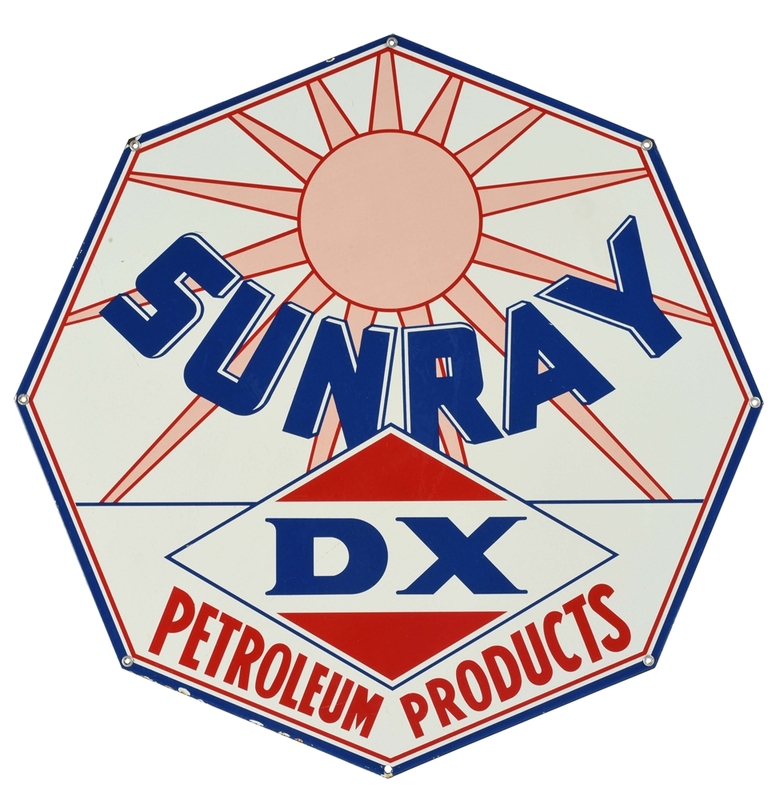 Lot #41: DX Sunray Petroleum Products Porcelain Lubster Sign. 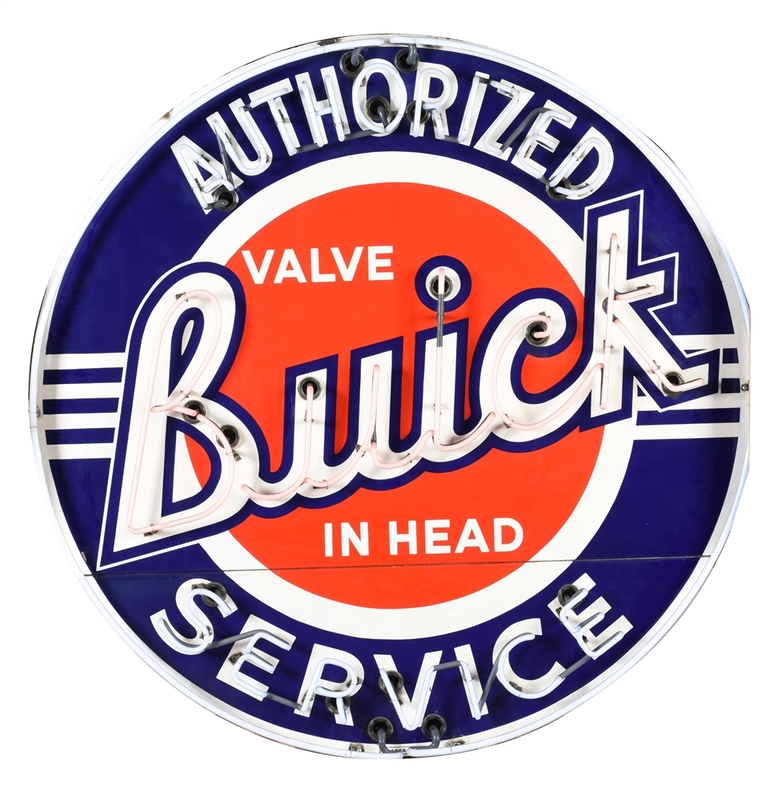 Lot #42: Outstanding Buick Valve In Head Authorized Service Dealership Porcelain Neon Sign. 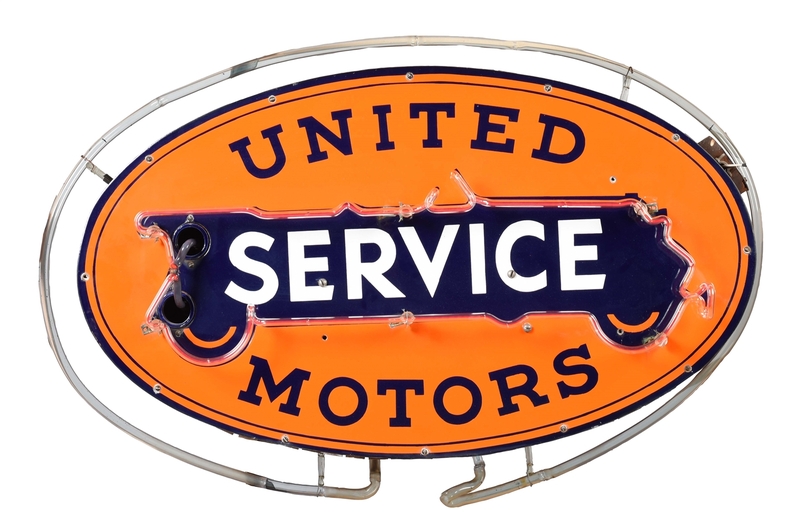 Lot #43: Outstanding United Motors Service Porcelain Neon Signs On Original Can. Lot #44: Automotive Service Die-Cut Arrow Double Sided Porcelain Neon Sign. 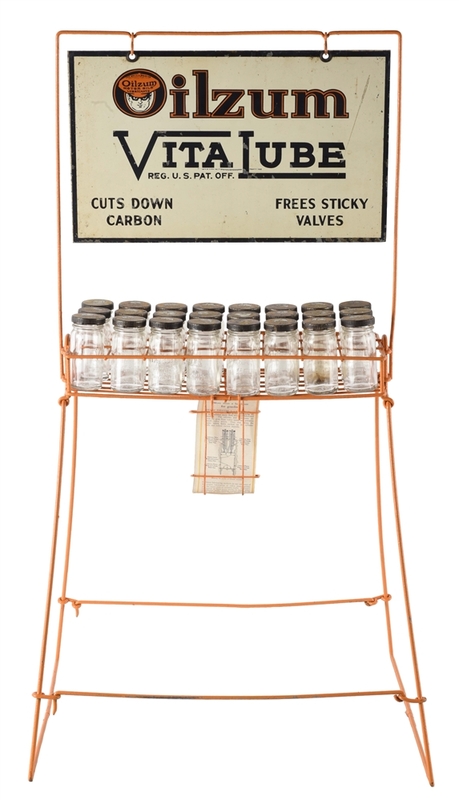 Lot #45: Rare Ace High & Avio Lubricants Salesman Sample with Tin Ace High Bottle Stand. 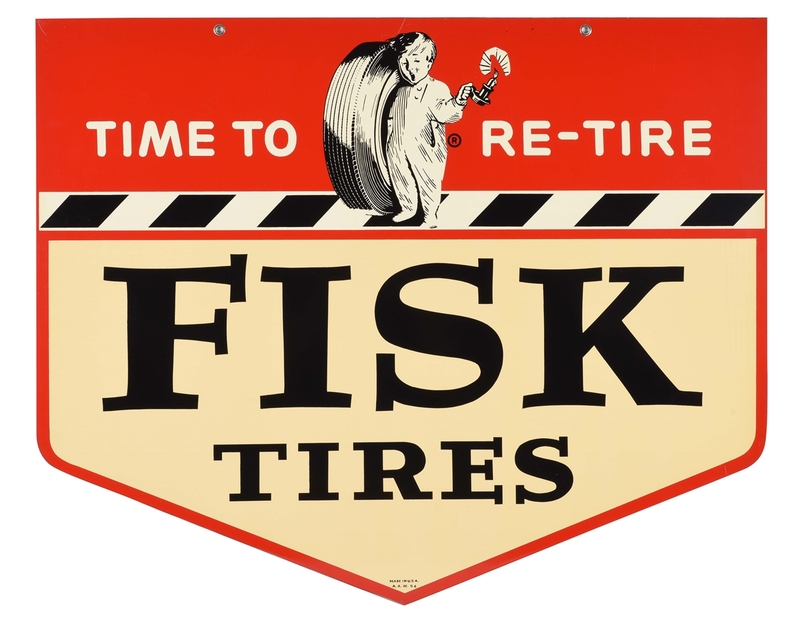 Lot #46: Fisk Tires Time To Re-Tire Tin Sign with Fisk Boy Graphic. 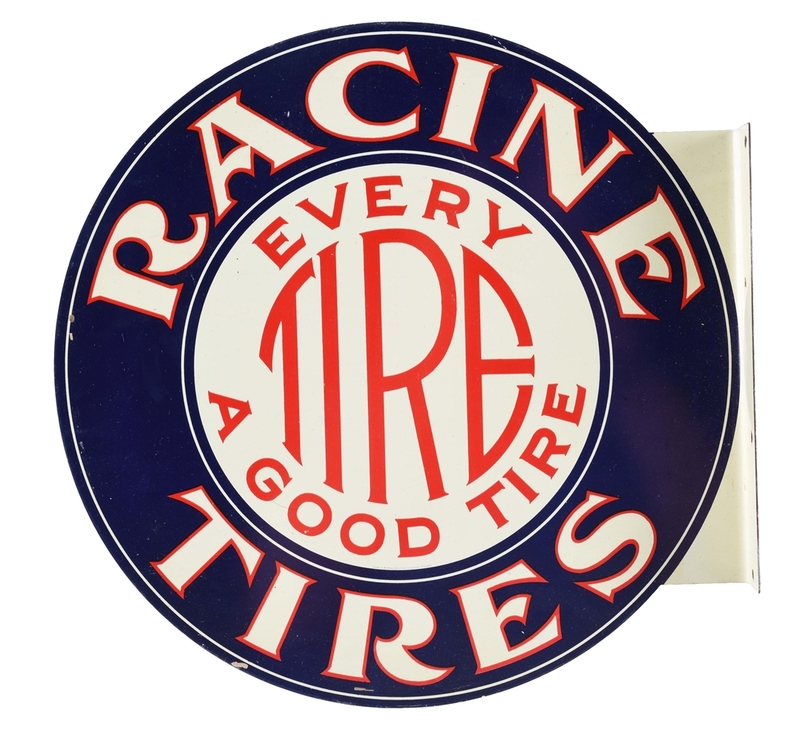 Lot #47: NOS Racine Tires Tin Flange Sign. 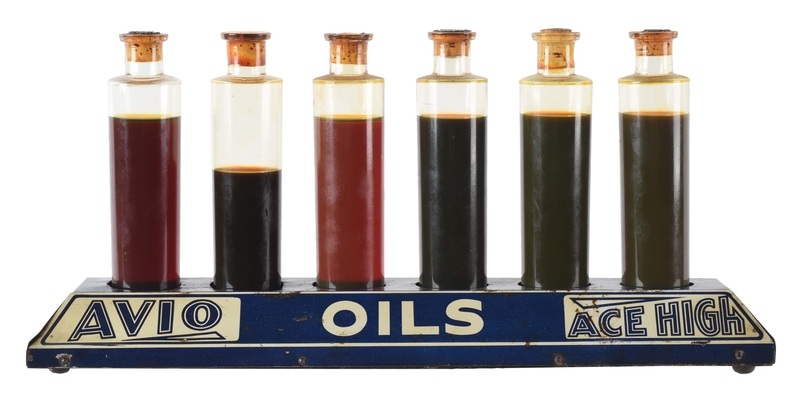 Lot #48: Oilzum Motor Oil Vitalube Sign with Stand & 24 Embossed Oilzum Bottles. 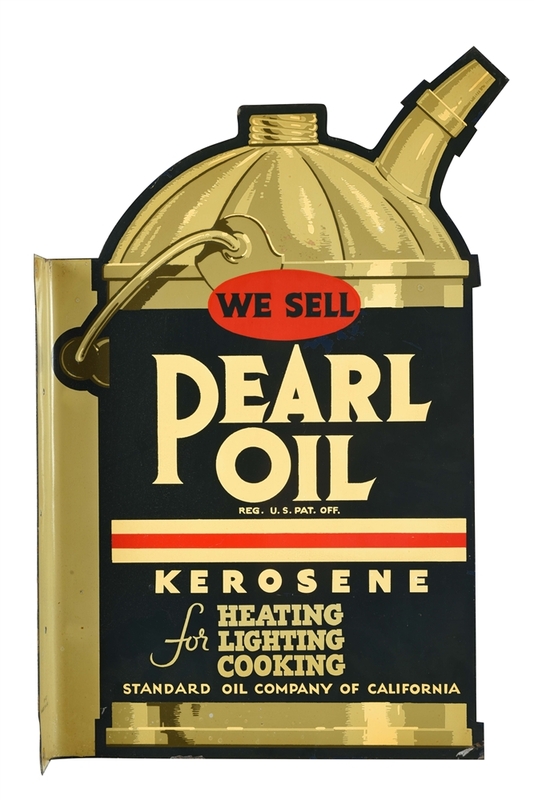 Lot #50: New Old Stock Standard Oil Of California Pearl Oil Die-Cut Tin Flange. Lot #51: Prestolite Battery Service Embossed Tin Sign with Original Wood Backing.